Ludwig van Beethoven was born December 16, 1770 in Bonn, now Germany, then the capital of Cologne and part of the Holy Roman Empire. He was a brilliant pianist and one of the most famous and influential of all composers. He was considered a child prodigy and is said to have studied with Mozart and Hayden in Vienna. Like all cultural workers of the time, even geniuses had to rely on the well-off nobility to be their patrons. But Beethoven’s behavior was anything but sycophantic. One story has him walking with friends when a nobleman passes by. They all bow but he does not. When asked why, he intimated that noblemen were a dime a dozen but there was only one Beethoven! At one time he was an admirer of Napoleon who rose to prominence during the latter years of the French Revolution. Beethoven’s Third Symphony “Heroica” was dedicated to Napoleon. But when he declared himself emperor, bringing back the monarchy to France, Beethoven tore up his dedication page. The famous opening to Beethoven’s Fifth Symphony — dah dah dah dum — has had different interpretation over the years. Some said it was the sound of birds chirping that inspire him, others that it was fate knocking at the door. Matthew Guerrieri has written a book about this symphony, called The First Four Notes: Beethoven’s Fifth and the Human Imagination. Guerrieri writes about how Beethoven’s piece resonated with everyone from revolutionaries to Romantics, and German nationalists to anti-German resistance fighters. In an NPR interview, Guerrieri said: “The way I approach the Fifth Symphony’s opening movement, is via the French Revolution, which Beethoven was very caught up in at the time, and the music associated with the French Revolution, and that particular hymn [of Claude Joseph] Rouget de Lisle, ” who wrote La Marseillaise: “I will die, sword in hand, for the rights of man and for the glory of the revolution and the Republic. Beethoven’s 9th Symphony is considered by many to be his finest accomplishment, composed towards the end of his life when he was totally deaf. Its choral finale was the first time a major composer used voices in a symphony. Beethoven decided early on that he wanted to compose a musical setting for German poet Friedrich von Schiller’s poem with its vision of the unity of all mankind, Ode an die Freude, Ode to Joy, ideals that Beethoven shared. There have been several “flash mob” performances of the finale and it has often been performed at national and international peace rallies and conferences. 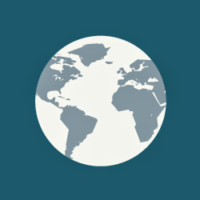 The works of Beethoven, including small ensemble pieces and piano sonatas as well as the symphonies, are performed and enjoyed worldwide and belong to all of us. 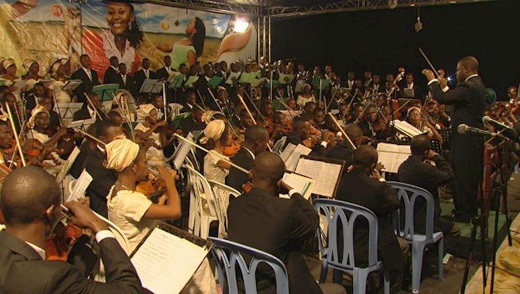 Photo: The Kinshasa Symphony Orchestra performing Beethoven’s 9th symphony.